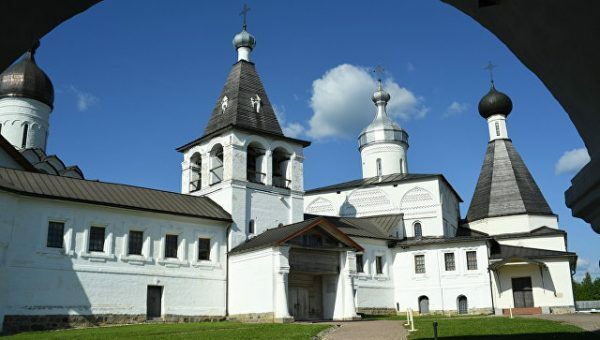 Ferapontovo (Vologda region), June 16 – His Holiness, Patriarch Kirill of Moscow and All Russia, visited on Saturday the world famous Ferapontov monastery in the Vologda region, where the frescoes of Dionysius were preserved, and expressed his hope that in this monastery, where a museum is now located, a full-fledged church life will begin to revive. “Today, after going through a difficult historical period, we again have the opportunity to pray at these shrines. May God grant that these places, both the Ferapontov Monastery and Kirillov Monastery, were not merely places of attraction for people interested in art, but that these places became the sites of intense pilgrimage and the sites where prayer to God is given,” said the Patriarch, addressing the people from the porch of the Church of the Ferapontov Monastery. “Then the frescoes of Dionysius will shine for you, because Dionysius did not paint pictures. He did not create something that should satisfy the aesthetic taste. He wrote iconographic images, looking at which people should mentally turn their eyes to God. May God grant us the chance that this will be exactly how the frescoes of Dionysius will speak to us,” he added. “Then visiting this place will not only expand your cultural horizons, but also spiritually elevate you, and enrich you with the ideals which our people had lived by, and which had formed the true spiritual strength of our people,” concluded the Patriarch. Currently there is a museum in the buildings of the former monastery. 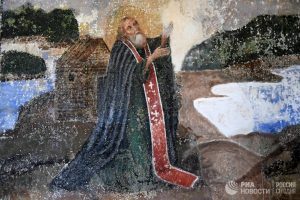 There is also an archbishop metochion of the Vologda Metropolia there, but the full-fledged church and monastic life has not yet been revived in the Feropontov Monastery. On the same day, His Holiness, Patriarch Kirill, visited Kirill Belozerov Monastery, another important center of the Russian North. There is now a museum and a monastic community there, which has 16 inhabitants. Communicating with the clergy of the Vologda diocese during the inspection of the frescoes of Dionysius, Patriarch Kirill told them how in 1969 he tried to see the frescoes for the first time. He sailed there from Leningrad and it was extremely difficult to get to the Ferapontov Monastery. “There were neither buses, nor other regular transport, so I had to walk or get a ride from the passing transport. I came to the church in awe, but it was closed. I found the museum warden and told him that I wanted to see the frescoes very much,” the Patriarch recalled. However, he was unable to see the frescoes of Dionysius that day. “The guide told me that he could not let me in, because if he opened the door the frescoes would be destroyed due to the air from outside,” noted the Primate of the Church. Ferapontov Belozerov Monastery in honor of the Nativity of the Most Holy Theotokos was one of the main spiritual and cultural centers of the Russian North for 400 years. There a unique ensemble of architecture and murals by Dionysius was preserved. The monastery is listed by UNESCO as a World Heritage Site.